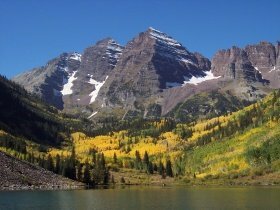 This page is a collection of some of my favorite Colorado fall hikes, including my top favorite hike at the Maroon Bells. When it comes to autumn color hiking in Colorado, I consider it to be the best fall color hike in the state. So, what is it? Well, it's the hike to Crater Lake. There are actually several hikes that start from the Maroon Bells parking area, all of which are great for different reasons. But the hike to Crater Lake is a bit longer, allowing you more time to enjoy the scenery all around you. Also, from Crater Lake, you get an up-close look at the Maroon Bells themselves. So, one more thing to think about before you go, is this: when is the best time to set out on Colorado fall hikes? The answer is that it varies a bit from year to year, but in general, it tends to be around the second two weeks in September. It can sometimes go into early October but it's probably best to aim for the last two weeks in September. O.K., so if you're ready for some Colorado fall hikes, I'll start you off at the Maroon Bells. Any of the hikes on that page are great fall color hikes but I highly recommend the hike to Crater Lake. Also, the pictures on that page were taken during the summer; so here's an example, (to your right), of how the Maroon Bells look during the fall. Now that you know my top favorite fall color hike, I'll tell you about other Colorado fall hikes that we've done and that I consider to be good for enjoying autumn colors. This next hike is in the same general area as the Maroon Bells, so if you have the time, you might consider doing one on one day, and the other on another day. Directions to Thomas Lakes trailhead: from Carbondale, go south on Hwy. 133 for about 1.4 miles. Then turn left onto Prince Creek CR and travel about 6 miles to a fork in the road. At the fork, turn right onto Road 311 and follow it for about 2 miles. The trailhead is about 1/4 mile before you reach Dinkle Lake, and you'll see the Thomas Lakes trailhead sign on your right. The parking area for Thomas Lakes is on your left in a fenced area, and is fairly good sized. 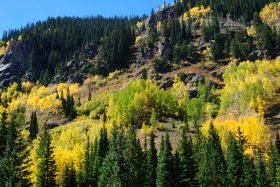 If you're doing this hike on a weekend, it's best to arrive as early as possible since this is one of those Colorado fall hikes that's very popular. The trail to Thomas Lakes starts out by joining up with an old jeep road shortly after you start the hike. It leads through a forest and is very rocky, so watch your footing. In a little over one mile, you'll come to some open meadows, and from there, you'll see Mount Sopris standing out prominently in front of you. Aspen trees are all around you, and as you continue up the trail, views of Mt. Sopris get even better. Follow the signs for Thomas Lakes and Mt. 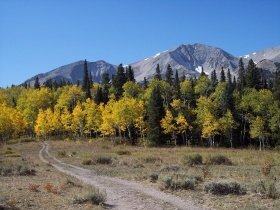 Sopris, then at the two-mile mark, you'll enter the trees again. From there, you'll go in and out of the trees, with views of Mt. Sopris in different places along the way. Eventually, you'll notice a small lake in the trees off to your right. From there, it's only about ten minutes to the first Thomas Lake, which you'll see on your right. From the first Thomas Lake, go back to the main trail and follow it for a short ways to the second Thomas Lake, which you'll see on your left. One thing to be aware of is that we saw bear droppings several times along the trail, so they live in the area. We saw no bears though, and Colorado fall hikes like this one are a great way to enjoy the autumn colors. Bring your camera! Directions to Piney River Falls trailhead: from Hwy. I-70 west near Vail, take the Vail exit #176. Then take the North Frontage Road west. After about one mile, turn right onto Red Sandstone Road. Go for about 2.5 miles to a fork with a dirt road on your left. Turn left there onto Red Sandstone Road #700. Follow the dirt road for about nine miles to the big sign over the road that says Piney River Ranch. The ranch is private property but there is public parking just outside and to the right of the entrance. Of the Colorado fall hikes that we've done so far, this one reminds me of the Maroon Bells, near Aspen. It's kind of like Vail's version of the Maroon Bells because the mountains are big and right there in front of you, (like the Maroon Bells), and the hiking trail goes straight towards them, through lots of aspen trees. So of course it makes for a great fall color hike :-). Anyway, the trail starts on the other side of the road from where you parked your car. As you head out, you'll soon come to Piney Lake, as well as the wide-open view of the Gore Range. Before long, you'll come to a fork in the trail and a sign; take the right fork to follow the directions towards Upper Piney Lake. The view in front of you at this point will also feature all those wonderful aspen trees. Continue along the easy path and eventually, you'll enter the aspen forest. Shortly after that, the trail starts to climb moderately, and you'll also be crossing several streams on log bridges. Continue on through the aspen forest and at one point, the trail will actually start going down. From there, it's not too much further to the falls. The falls are actually more of a cascade than a waterfall, which is why the hike is on this page rather than my Colorado waterfalls page. If I had to rate this hike, I'd say it was my second favorite, (after Maroon Bells), of the Colorado fall hikes that we've done so far. Cub Lake is in Rocky Mountain National Park, and it's one of the few Colorado fall hikes that you will find there. The above link will take you to a page with more information about Cub Lake; it's the first hike on that page. Have fun and be on the look-out for elk, since the bottom portion of this trail is a place where they are often seen, especially during the fall. Directions to Dark Canyon Trail trailhead: from Hwy. 135 in Crested Butte, go west on Whiterock Ave. which becomes Kebler Pass road, (and County Road 12.) Drive about 12 miles then turn right at the sign for Horse Ranch Park, which is the trailhead for this hike. Of all the Colorado fall hikes we’ve ever done, this one has more aspen trees along the way than I can remember seeing anywhere else. 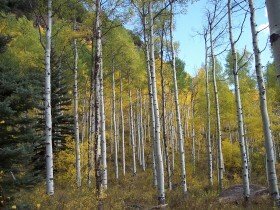 In fact, you’ll be hiking through aspens for most of this hike. Anyway, when you’re ready, the trail starts uphill along the old jeep road that you’ll see in front of you when you enter the parking area. After a short time, you’ll come to a sign saying “Dark Canyon Trail”. You want to head straight and downhill on this trail. Soon after that, you’ll see some beaver ponds on your left, along with a large beaver lodge. The hike to Booth Falls is another good Colorado fall hike. The waterfall at the end isn’t as nice at this time of year, but the golden aspens definitely make it worth the hike. Anyway, the above link to Booth Falls will take you to my Colorado waterfalls page, and my description of it is the 6th one down, starting with Continental Falls. It’ll give you directions there, and a description of the trail. Directions to Beaver Lake trailhead: from Vail, take I-70 west to the Avon exit which is #167. At this exit, turn left and head south from the roundabout onto Avon Road. Continue south under the interstate, past U.S. 6, then to the gate for Beaver Creek. At this point, the road name changes to Village Road. After passing through the gate for Beaver Creek, follow Village Road up to, (and into), the Beaver Creek Village parking garage…you can’t miss it. 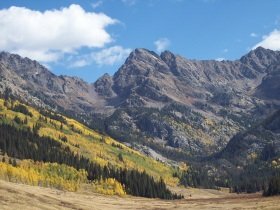 This is one of the few Colorado fall hikes on this page that has lots of elevation gain; nearly 1700 feet, about the same as the hike to Thomas Lakes. You’ll definitely get a workout on this one, and you also definitely need water, so make sure to bring plenty of it. Anyway, this hike starts from the base of the Centennial Express chairlift which you’ll see just a short ways outside of the parking garage. You will see a variety of signs near the chairlift, and you want to follow the one that says “the 5 senses trail”. This trail is easy to moderate, and follows the creek on one side, and the road on the other. It passes through areas of spruce trees and some aspens. At the end of this trail, is the beginning of the Beaver Lake trail, and you’ll see the big sign for it. At this point, you’ll be following a fairly wide, smooth path. But don’t be fooled, because as I mentioned before, this is one of the few Colorado fall hikes on this page that has lots of elevation gain. You will be going uphill for most of this hike, but you’ll also be following the creek, as well as seeing lots of fall color all around you, and that definitely made it all worth it to me :-). As you climb, you will get into more open areas where you’ll see more aspen trees on the mountainsides across from the trail. At one point, you will walk under the chairlift. Continue on up this Colorado fall hike, and take your time since you will only find a few easier sections of trail. At another point, you’ll cross the creek on a bridge. Keep going up and you’ll continue seeing more aspen trees on the mountainside across from the trail, as well as plenty of pine trees. After what seems like a long time, you will reach the boundary for the Holy Cross Wilderness. From this point, it’s only .3 mile to the lake so you’re almost there. Shortly after this, the trail narrows and the creek is below you on your right. Continue along this Colorado fall hike until you reach the lake. Once there, you might be greeted by grey jays and/or chipmunks. We were greeted by both, and one of the grey jays even landed on my hand, looking for a few crumbs! Directions to East Lake Creek trailhead: from Vail, take I-70 west to the Edwards exit which is #163. As you come off the exit, turn left and go through Edwards to the intersection with U.S. Hwy. 6. Turn right onto U.S. Hwy. 6, then go 0.7 miles to Lake Creek Road. Turn left onto Lake Creek Road, and go 1.8 miles to West Lake Creek Road. Turn right onto West Lake Creek Road, pass Pilgrim Downs, and keep going, (about 4 miles from your turnoff), to the trailhead which is just before the road closure gate. You’ll see the trailhead on your left. The road to this trailhead turns to dirt, but it’s a good dirt road. Also, the parking area isn’t that big; it might hold around 6 or 7 cars. So as usual, the earlier you can get there, the better. Anyway, this Colorado fall hike goes to the wooden bridge at East Lake Creek. You can go further if you want to, but we thought this was a good turn-around point. 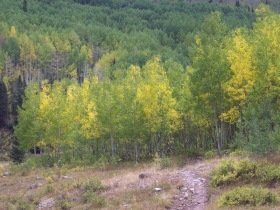 As many Colorado fall hikes do, this trail starts uphill and goes through an aspen forest. In fact, you’ll be hiking through an aspen forest for most of this hike. You will also see lodgepole pines along the way. We saw three birds that resembled a blue grouse and one of them flew into a tree. We also saw a woodpecker and heard some chickadees, so it seemed to be a good birding trail. When we did this Colorado fall hike, some parts of the trail were covered with a gold carpet of aspen leaves…it was beautiful. :-) Anyway, you will eventually reach a sign that says “Holy Cross Wilderness”. Once there, you have to register. From that point, you’re about ¾ of the way to the bridge at the creek. Shortly after entering the wilderness, this Colorado fall hike becomes more open, and stays that way most of the way to the creek. Once there, you can continue if you want to. Or, relax, enjoy, and when you’re ready, go back the way you came, and be ready for a good amount of uphill hiking. Directions to Snowmass Creek Trail trailhead: from Hwy. 82 at Old Snowmass, (which is 14 miles west of Aspen), go south on Snowmass Creek Road, (at the gas station), to the “T” intersection at 1.8 miles. Then turn left on Snowmass Creek Road. Go for 9.2 miles, and cross a bridge over the creek. In one quarter of a mile, turn right at another “T” then go 0.4 miles to the trailhead parking lot at the end of the road, just before the gate. (You’ll see a sign saying Snowmass Falls Ranch.) Regular cars can make it here, (the road does turn to dirt), and the parking lot holds around ten plus cars. The trailhead is to your left, as you’re facing the sign that says Snowmass Falls Ranch. The sign at the trailhead says: “Maroon-Snowmass trail”, and although the trail goes all the way to Snowmass Lake in 8.5 miles one-way, we only hiked this trail 1.7 miles one-way to the White River National Forest boundary sign. You can go as far as we went, and turn around, or further if you want to…it’s up to you :-). 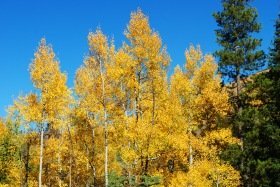 This Colorado fall hike starts out by taking you uphill through an aspen forest. In a short time, you’ll reach the first of three gates. Go through the gate, (remembering to close it behind you), and continue through the aspen forest. The trail continues to climb, (though not steeply), for a while before leveling off to become a mostly flat and easy trail. Looking off to your right, you’ll be able to catch glimpses through the trees of the mountainside opposite the trail, which is covered with a large aspen forest. If you can catch it at the right time, you’re in for a treat :-). Eventually, you’ll reach the second gate. At that point, (and beyond), the forest opens up and you’ll have wide open views of the large aspen forest that’s off to your right. 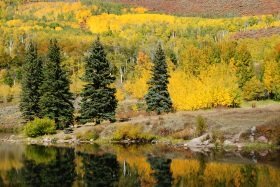 Continue along this Colorado fall hike, and in a short time, you’ll reach a split in the trail where the right fork follows the West Snowmass trail. You want to go left, (straight), along the Snowmass Creek trail. Before long, you’ll reach the third gate. Pass through it and shortly after that, you’ll reach the boundary sign for the White River National Forest which is the turn-around point for this hike. Entrance fee: this seems to change. We have been here many times, and sometimes there’s a fee, and sometimes not. So be prepared, just in case. 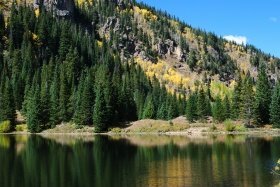 So, if you’re ready, you can do this Colorado fall hike around the lake in either direction. We chose to go left in a clockwise direction. The first part of this hike is easy and soon takes you to a bridge that crosses the outlet stream of Lower Cataract Lake. You’ll see aspen trees all around you so have your camera at the ready…I took lots of pictures on this day! Before long, you’ll reach a section of the trail where you can see the waterfall in front of you, high up on the mountainside above the lake. Unfortunately, it’s not very accessible for a close-up look. Shortly after this point, you’ll enter a pine forest which is cool and shady. As you walk through this forest, peak through the trees on your right and you’ll be able to see the aspen forests across the lake from you. Eventually, you’ll come to a spot along this Colorado fall hike where you cross Cataract Creek on a bridge. I wish I could say that you can see the waterfall from this point, but unfortunately, that’s not the case. There are too many trees in the way! Soon, you’ll reach the other side of the lake, and walk through a combination of open and forested areas. The trail on this side of the lake becomes a little more moderate, but not too bad. Continue along this trail and before long, you’ll reach the dirt road which completes the loop. It’ll take you back to the parking lot and your car. I have to say that this turned out to be one of my favorite Colorado fall hikes of the ones we’ve done so far :-). I'm planning on doing more Colorado fall hikes next fall. In the meantime, enjoy the ones you see here. Also, if you know of any fall color hikes that you think should be on this page, do feel free to let me know about them :-). Return from Colorado Fall Hikes to Colorado Hiking Vacations home page. 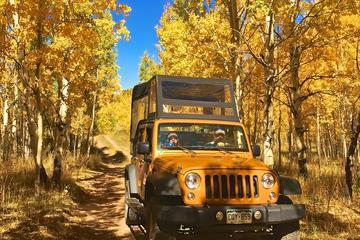 If you're going to be in the Canon City area, you might want to consider taking a fall color jeep tour. It's a way to get a different perspective on the changing colors, plus you'll see more areas and you can let someone else do the driving :-). If that sounds like something you might want to do, just click on the below photo of the jeep. It will take you to the page where you can get more info., and if you're still interested, you can book it. It's an affiliate link, and if you decide to book it, I will earn a small commission. Thank you so much :-). 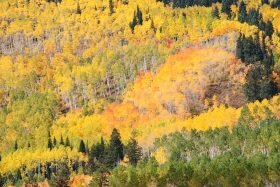 Climb 5,000 feet above Canon City into the high gold mining districts to witness the yearly color change of the aspens on this full-day tour. 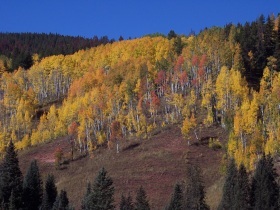 The Colorado leaf color change varies year to year but typically starts in September and continues into October. 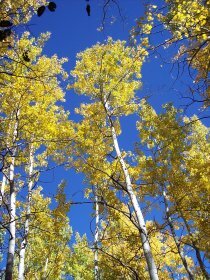 With warmer weather than the rest of Colorado, crystal blue skies over the gold and yellow leaves make for the perfect photo opportunity. Don't forget your camera! Did you find a great Colorado fall hike? If so, let us know the name of the trail, where it is, and some information about the trail itself. Include some pictures if you have them, and please include the date you hiked this trail. (Or as close to it as you can.) This way, everyone will know where and when to see the fall colors at their best :-). Enter the name of the trail here. Everything you write will appear on a web page exactly the way you enter it here. You can wrap a word in square brackets to make it appear bold. For example [my story] would show as my story on the web page containing your story. Did you take some fall color pictures during your hike? Great! Click the button and find the first one on your computer. Select it and click on the button to choose it. Important note: the maximum image size that can be accepted is 800x600 pixels. If you need to resize any photos, you can use a web-based resizer like Picmonkey. This is the one I use, and it's very easy to work with.